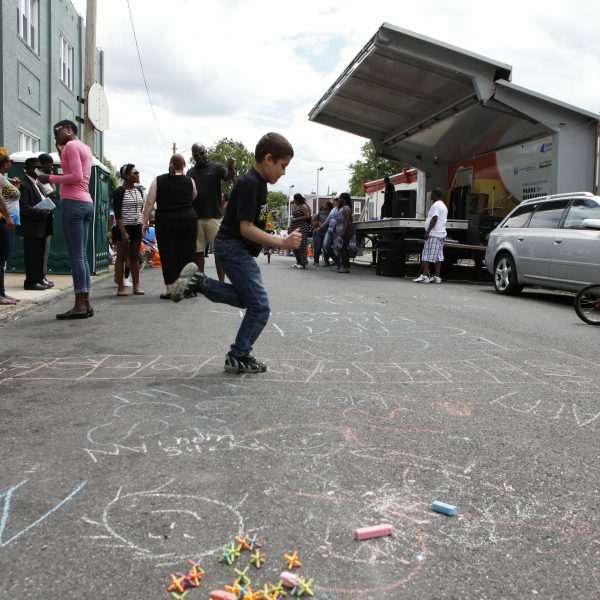 On June 28, Episcopal Community Services celebrated the 15th anniversary of ECS St. Barnabas Mission with a block party at 60th and Girard Avenue. Located in the Carroll Park section of West Philadelphia, ECS St. Barnabas Mission is a shelter for homeless mothers and their children. In attendance were current and former residents of the Mission, their families and friends, ECS staff, board members, supporters, and the wider Carroll Park community. Fifteen years ago, ECS St. Barnabas Mission moved into its present home at 60th and Girard Avenue and became an integral part of ECS. Families come seeking shelter, but they leave with much more thanks to case management, health services, and education assistance. The long-term goal is to help mothers and children to become self-sufficient. In addition to supporting homeless families at the Mission, a Community Food Cupboard at the same location has served hungry families in the area for over a decade, and St. Barnabas Mission maintains close ties with the Carroll Park community – participating in block clean ups and supporting local leaders. “We are deeply committed to our relationship with the Carroll Park community and enjoyed celebrating this milestone together,” said Dave Griffith, executive director of ECS. The afternoon’s festivities included a performance by the Universal African Dance and Drum Ensemble and the reading of a commissioned poem by Supreme Dow, founder and executive director of the Black Writers Museum.